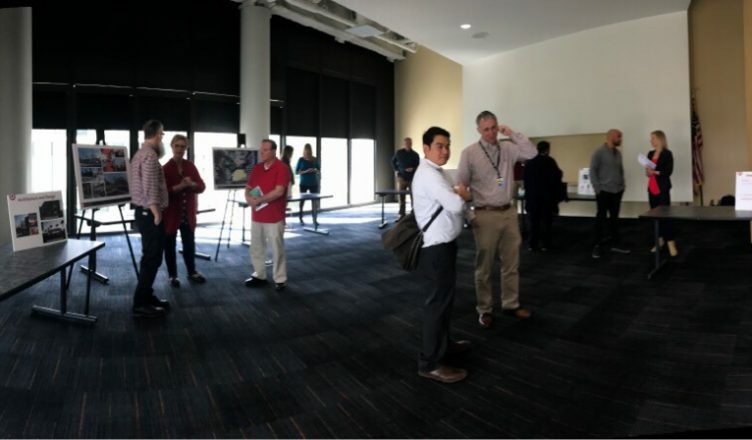 Target and UC San Diego representatives hosted an open house event at Price Center West Forum on Wednesday morning with the purpose of opening up talks for a Target store opening on the first floor of what is currently the campus bookstore for 2020. Should the proposal be implemented, the bookstore would continue to occupy the second floor but limit its stock to items such as UCSD merchandise. The event opened with presentations from all the representatives which included UCSD’s Executive Director of Real Estate Jeff Graham, Target Senior Development Manager in Real Estate Laurie Jones, and Target Director of Real Estate Kim Hayden. Following the presentations, the representatives, including a UCSD Bookstore representative, answered questions from UCSD faculty, students, and employees who turned out for the event. The open house ended by inviting those who attended to visit a couple of tables with more information on Target’s proposal and operations. When explaining the success of the small store concept, Hayden mentioned that it has become popular across the country because people like the convenience of having such stores within their own neighborhoods. A small format Target store is drastically reduced in size compared to the full-sized stores. The Mission Valley Target store in San Diego is about 98,000 square feet, about five times as big as the average 20,000 square foot, small-size stores. These stores also differ in the variety and quantity of their stock, with the small Targets’ selections “depend[ing] on the location and the need of the neighborhood [where it is located],” Hayden added. Jones explained how a small-format store would operate on campus. “Our campus stores would expect to hire between 40 and 60 employees with the hope that most of the employees would come from the campus and the surrounding neighborhood. Target would provide a really good opportunity for part-time work right on campus,” Jones said. The store operations would include deliveries by two small semi trucks twice a day in order to keep prices low. Jones noted that 90 percent of the merchandise comes from the Target distribution center located in Rialto, CA, and the other 10 percent from local vendors. Their waste disposal is located inside the store building, and they explained that they would “potentially be a part of a larger building here. … We would integrate into [the UCSD Bookstore’s] trash system,” Jones stated. There are currently three small-format Target stores on college campuses in California. The first one opened at UC Berkeley in 2013, and two opened last summer at UC Irvine and at University of Southern California. Hayden clarified that none of these Target stores are located on the campus but are adjacent or very close to the campuses. The proposal of opening a Target store on a campus, such as UCSD, is a new concept for the major retailer.